Home » Best Juicers » Is A Juicer Press Right for You? Is A Juicer Press Right for You? A juicer press is a popular juicing machine that uses pressure to extract juice, but has some pros and cons. Are you considering a healthier diet, which includes your fresh versions of your favorite fruits or vegetables? If so you have likely considered a home juicer so, you can make delicious yet healthy mixtures at home. However, which juicer should you choose? One very popular choice today is the juice press, a versatile machine that can make a variety of tasty drinks in the privacy of your own home. This type of juice extractor is very much what it sounds like, a machine that uses pressure to extract juice from a variety of fruits and vegetables. These machines are very often of stainless steel construction with a glass container or quality plastic container to catch the juice. Each movable piece of the mechanism is generally removable for easy cleaning. Most juicer presses are manual machines, which mean you are going to have to supply some of the energy required to extract your favorite juice. The nice thing about manual models is the fact that they are generally cheaper than electric presser juicers. You will also find there are a variety of juicer press options on the market today. For example, you can choose a wheatgrass presser, citric presser or a simple manual orange juicer. Since the machines themselves tend to be reasonably priced, you could have more than one. However, not all press juicers are cheap! Some heavy-duty commercial grade models are even more expensive than many electric juicer options. If you are making juice for the masses a presser machines is probably not the best option. After a dozen apples or bananas with a hand juicer, you are going to be feeling it in your hands, wrists and shoulders. For large families or situations where you would like to prepare larger quantities, use an electric juicer press option like the Breville 800CPX as a better choice, but can more expensive. Are Their Better Choices for You? You should also take into consideration the types of produce you will be using in your machine. Soft fruits will be much easier to juice than fibrous vegetables and can be easily processed in a manual or electric juicer press. On the other hand if you are considering harder vegetables a centrifugal or masticating juicer is likely the better choice. There are also single and twin auger options you can consider depending on budget, taste and plans. 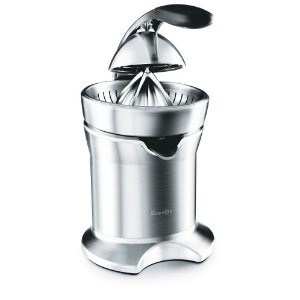 A juicer press is the perfect choice for the individual who is new to juicing. You will want to experiment, in small quantities likely, with different fruits and softer vegetables. No point in going all out and creating gallons of juice either you will not like or that will oxidize before you get the chance to drink it. These machines are generally economical and easy to use so why not get your very own juicer press today?